The spring insect chorus here at Land Between the Lakes is richer than I expected. 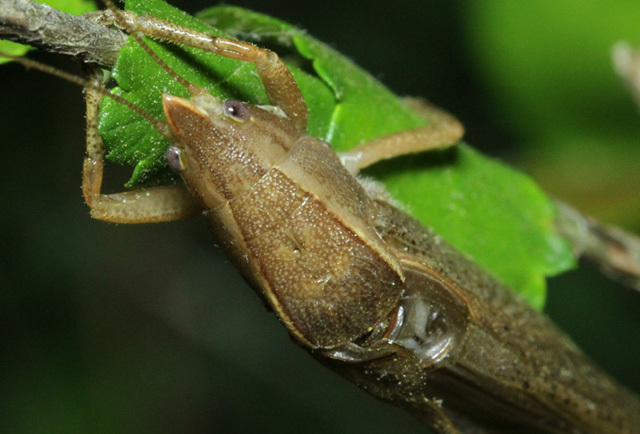 Last night when I returned to my camp at dusk and prepared to retire after a long and busy day, I became aware of a very high-pitched “shuffling trill,” not pretty like that of a trilling cricket, but non-musical like the shuffles and scrapes of various katydids. With the help of a directional microphone, I homed-in on the insect singer, recorded him, and then found him perched on the stem of a sapling growing at the edge of the forest. 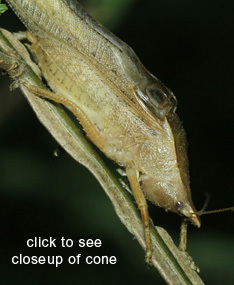 He was a brown-colored conehead katydid, about an inch-and-a-half long. The shuffling trill of a Hook-faced Conehead. Recorded at dusk by Lang Elliott at Land Between the Lakes, Kentucky, April 21, 2010. What species of conehead could the April Shuffler be? 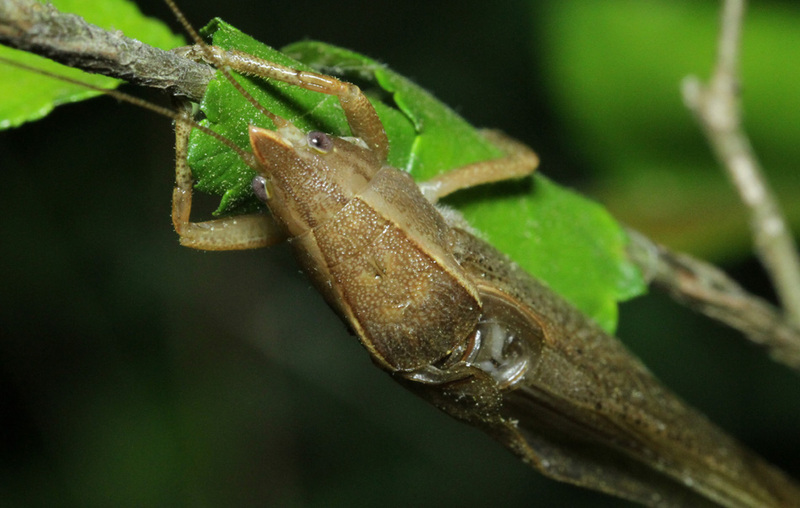 In our book The Songs of Insects, Wil Hershberger and I feature the songs of five common species of coneheads, but all overwinter as eggs and don’t start singing until mid to late summer. 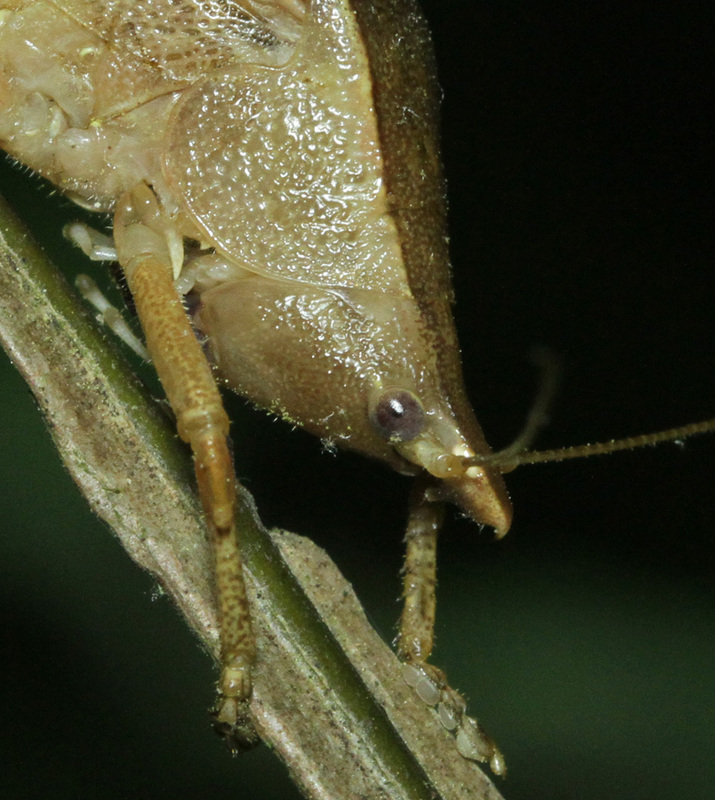 Consulting Tom Walker’s fabulous web site, Singing Insects of North America, I found that there are twenty-three species of coneheads in North America. But which one could possibly be singing in April here at my camp spot in western Kentucky? Sifting through Tom’s species descriptions and range maps, I was able to identify my shuffler as a Hook-faced Conehead, Pyrgocorypha uncinata, even though he is slightly north of the species’ supposed range (see map below). The name “hook-faced” refers to the down-curved hook at the end of his cone. Adults of this species mature in late summer and fall but do not become reproductively active until April or May of the following year. Either brown or green in color, the males sing from trees and wooded undergrowth. Mystery solved! But yet another mystery beckons. Earlier the same evening I discovered yet another springtime insect singer along the side of a road—he was producing a nearly continuous musical trill. I’ll call him The April Triller (ha, ha). Must be some kind of cricket (because lots of crickets trill like this), but one that overwinters as a nymph or an adult. But which one is it? I don’t have time to check right now, so why don’t you check for me by visiting Tom Walker’s Web Site and searching for the singer? Here is the April Triller’s song. The temperature was around 55 F. He is trilling at about 4kHz. I challenge you to tell me what species the singer is! What cricket would be producing continuous trills from along roadsides in late April in Kentucky? You tell me! Recorded shortly at dusk by Lang Elliott at Land Between the Lakes, Kentucky, April 21, 2010. The “True April Triller” sounds like a Southeastern Field Cricket to me. I like the gnatcatcher in the foreground of that recording, as well as the distant Barred Owl (I think) in the background of the recording of the Hook-Faced Conehead. Well, I know but I will wait to see if someone else can get the April Trillers ID. The Hooked-face is a great insect. I remember well our searching for this singer years ago in the woods were you are now.